18 snakes and what do you get? Medusa. The pre invasion goddess of abundance and protection. 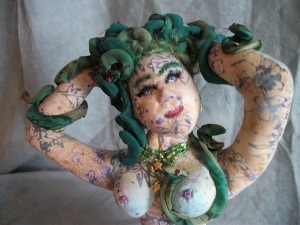 For months now I have been captivated by images of Medusa. I have drawn her several times and just had to incorporate these drawings into a doll. After creating the “Mermaid -Breaking Free” I suspect I am claiming my power again. This lady doesn’t need to break free of anything and doesn’t seem to be afraid of anything either. She was quite a challenge with all the snakes. 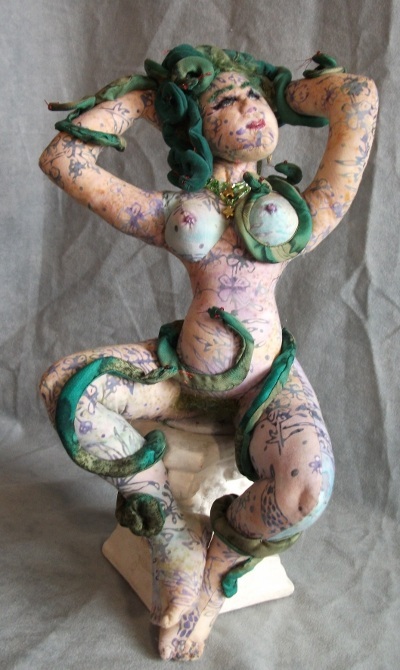 The snakes took just as long as creating the figure! Eighteen snakes – somehow seems like a mystical number it is made up of threes and nines. The base is not yet finished. The pillar is temporary until I get back from Edmonton. I realized that a heavy plaster pillar was not ideal for shows.